With multiple options to "give to what gets you going," Momentum aims to connect individual donors with compelling Emory projects that fit both personal interests and the university's priorities. Over the past several years, crowdfunding websites have helped individuals, organizations and companies raise billions of dollars for every imaginable purpose, from entrepreneurial ventures to charitable causes — and even for potato salad. Now Emory has launched its own crowdfunding site — dubbed Momentum — to support programs, projects and initiatives that are meaningful to members of the Emory community and beyond. "Fundraising is really matchmaking," says Kim Julian Bowden, executive director for Emory’s Office of Annual Giving. "This is a way of connecting passionate, involved volunteers and donors with opportunities that are important to the university and meaningful to them." 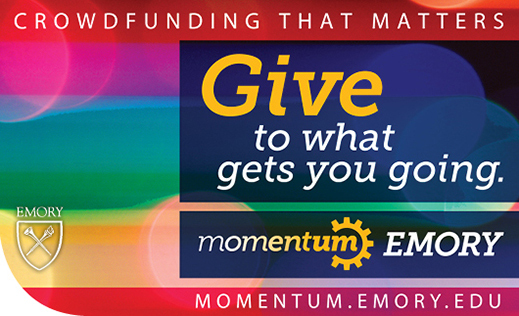 The new site, which launched today, encourages donors to "give to what gets you going." It will include Emory fundraising projects championed by employees, students and other volunteers who apply to the Office of Annual Giving for inclusion on the site. Projects will typically have goals ranging from $5,000 to $15,000 and will have a timeframe of 30 days to meet the goal. Donations are fully tax-deductible. "This provides a targeted way for project volunteers to share these fundraising campaigns through their own personal connections, reaching out to people who also feel meaningfully connected to the cause," explains Elizabeth Patrick, assistant director of development with the Office of Annual Giving. "There is a volunteer leader working with a group of volunteers, pooling their social networks to get the word out." The common denominator will be that all of the projects link back to fundraising priorities at Emory. An effort to raise funds for Emory’s Manuscript, Archives and Rare Book Library's LGBT Collections to record oral histories of Atlanta’s early HIV/AIDS activists. A program to raise scholarship funding for Candler School of Theology’s Youth Theological Initiative, a three-week, intensive summer program of justice-seeking theology education for high school juniors and seniors from around the world. A funding project for the student newspaper, The Emory Wheel, to update its equipment to support digital publishing. Each project will feature giving levels that mimic the gift levels used on many commercial crowdfunding sites but, instead of offering a prize, will educate donors on what gifts at each level can accomplish. "This allows us to focus on the charitable nature of the gift by giving tangible examples of the kinds of benefits their support provides," Patrick says. Emory joins a number of other universities in launching its crowdfunding site, including University of California–Los Angeles, University of California–Berkeley, University of Maryland, and University of Pittsburgh. More information and guidelines for Momentum projects and how to apply for inclusion on the site are available at www.momentum.emory.edu.